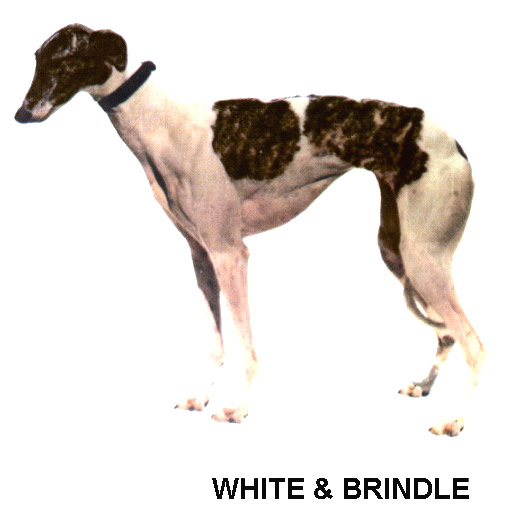 Racing greyhounds range from 24 to 30 inches tall at the shoulder, and active racers weigh between 40 and 80 pounds. Greyhounds are the smallest large dog you'll ever encounter! Although they are very tall dogs and can sprawl over an entire queen-size bed, they are also like a furry folding table. They can tuck in their legs and curl up into the most amazingly small spaces. They also tend to back up rather than try to turn and scurry when they are in the way. Greyhounds just don't seem to get underfoot, even in small spaces. 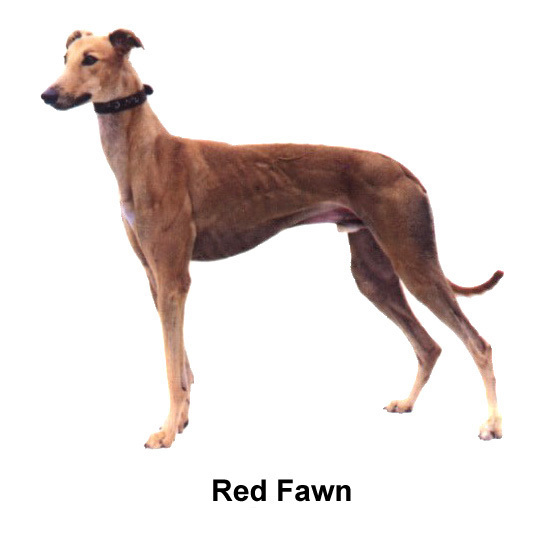 Greyhounds are not known for barking, although they will if they are sufficiently excited. This tendency towards the taciturn makes them ideally suited for living in confined or shared living spaces. Also, because they do not require more exercise than any other breeds (less than some as a matter of fact), owning a greyhound doesn't necessitate having a yard. If you are interested in owning a greyhound in an apartment complex with a weight restriction, ask your complex manager. Some apartment complexes make exceptions for greyhounds based on their reputation as being quiet, clean dogs. As an apartment dweller, you must be willing to brave all weather conditions to take the hound for its daily walks to take care of business...even during the night if they should become sick. Greyhounds are intelligent, clean, quiet and gentle. They are affectionate and thrive on love and companionship from their family. 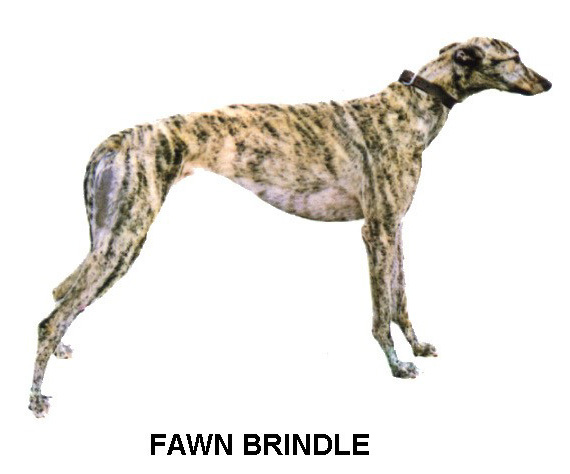 Greyhounds are affectionately known as the 45 m.p.h. Couch Potato. While they can run 45 mph for short distances and are the fastest breed of dog, they are content to spend their retirement snoozing on the sofa. 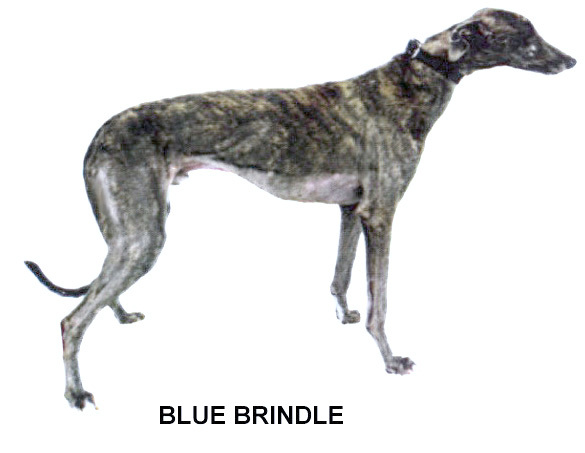 Greyhounds don't require any more exercise than other dog breeds and most are content with a daily walk. Greyhounds live an average of 12-14 years. 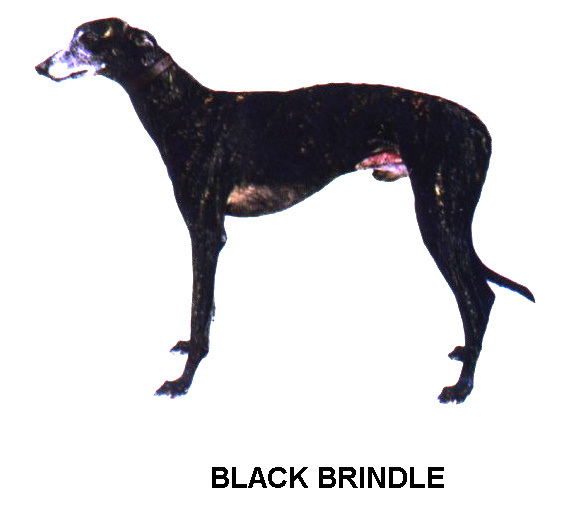 They are bred for speed and endurance. Because they are the best of the best they have no breed-specific health issues. Get your hound's teeth cleaned regularly - every six months is recommended - to prevent tooth loss and gum infection. There is a special dogie brush and toothpaste available at all pet stores that you can use at home to maintain clean teeth - weekly is recommended. Before our retired racers are ready for adoption they have their teeth cleaned, and attention to any gum disease or decay is addressed at that time (Orthodontics is not provided!). 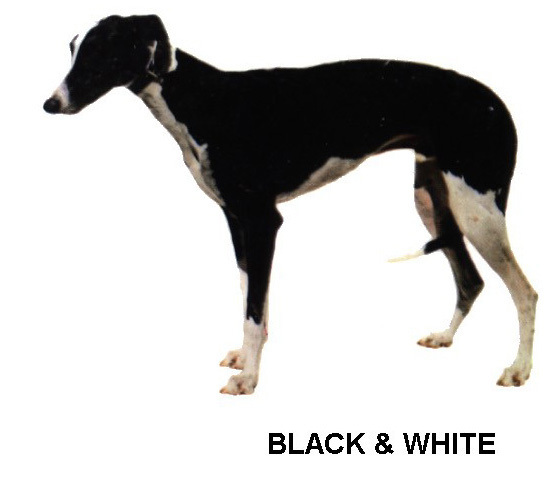 If you haven't counted them yet, greyhounds come in 18 different colors (not including total white) and many other variations exist. 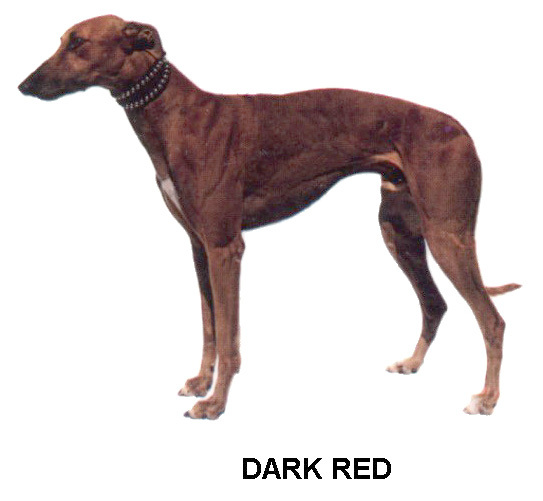 This chart is the "American Greyhound Track Operators Official Color Chart". 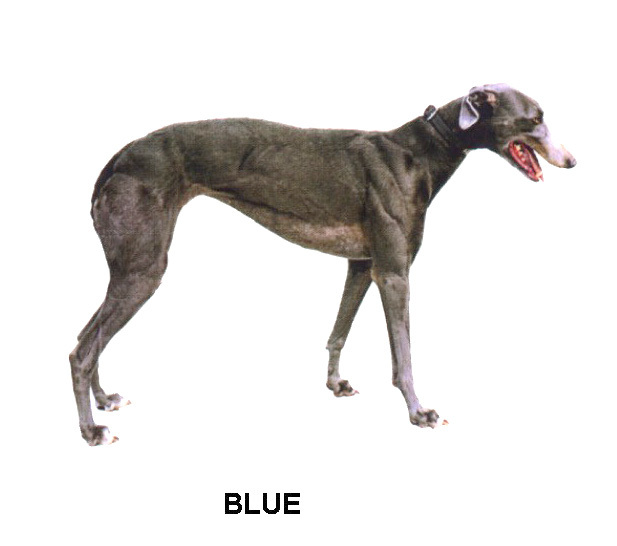 Greyhound Color Chart provided by Marnie Grosz, President & Director, Recycled Racers, Inc.
Greyhounds typically get along well with other medium to large-size dogs. Some also get along with small dogs, cats, and other critters. 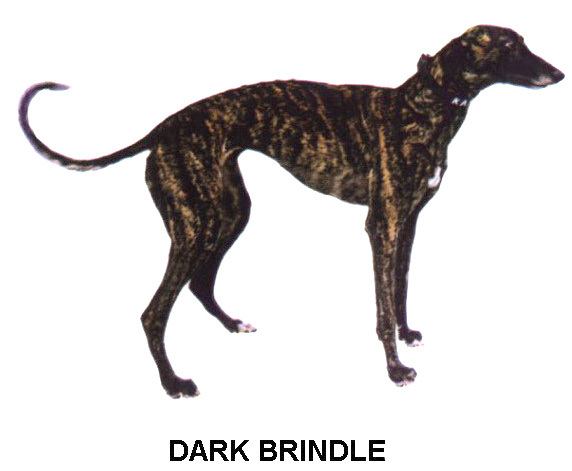 A lot of their tolerances of small dogs and cats is tied directly to their prey drive - the thing that helped make them winners at the track. You can quickly equate the lure they've been chasing all their life to something they should NOT chase! Confused? Racing greyhounds born in the United States are registered with the National Greyhound Association (NGA) located in Abilene, Kansas. For positive identification, they are tattooed in both ears when they are about 2 months old. The left ear has the litter identification number assigned by NGA. All greyhounds in the same litter will have the same number. 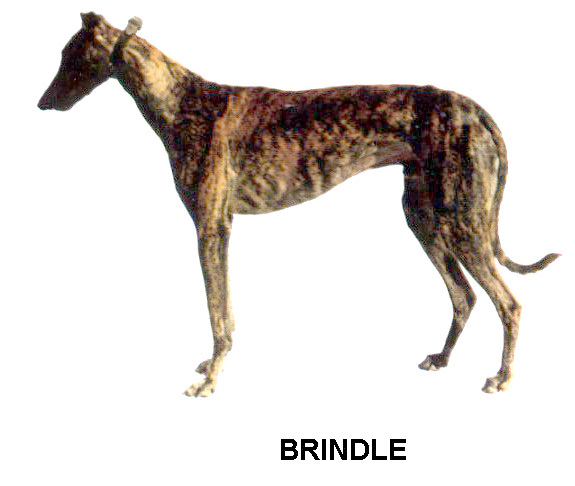 The tattoo in the right ear tells the greyhounds age. It consists of the numbers 1 through 12 for the month of birth, followed by the last digit of the year of birth. 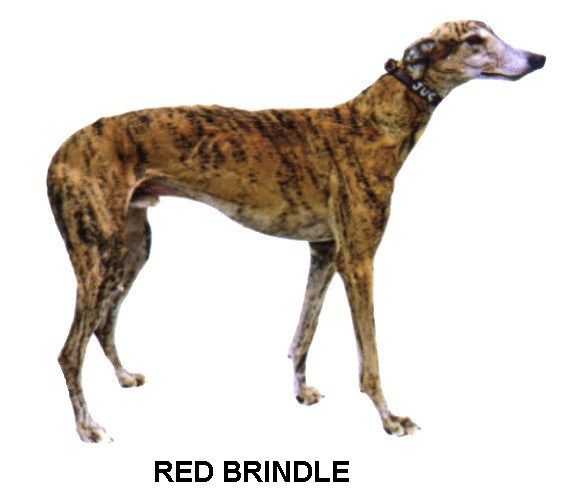 For example, 103 would indicate the greyhounds was born in October 2013 while 62 would indicate the greyhound was born was born in June 2012. 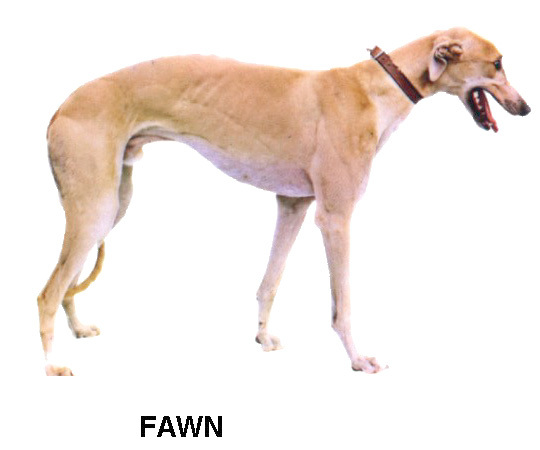 In order to differentiate the greyhounds in the same litter, the letters A, B, C and so on are used. 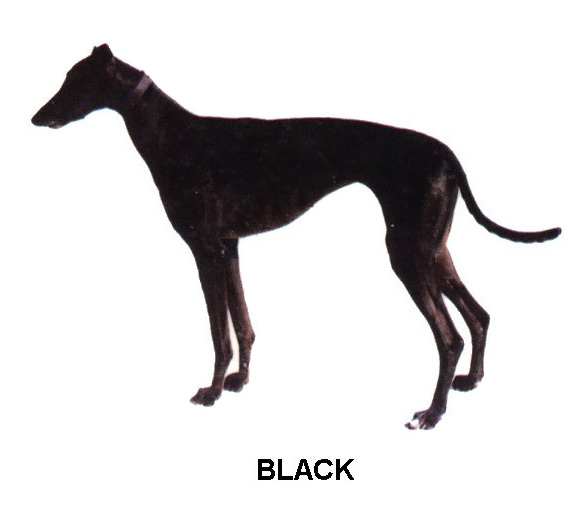 Therefore, greyhounds in the same litter would have the same tattoo in the left ear and in the right ear they would differentiate by a letter of the alphabet. 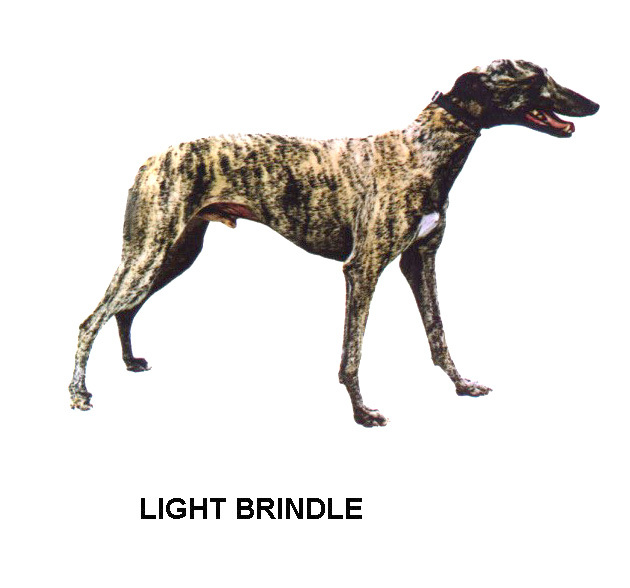 Thus, no one can lie about a greyhounds true age, nor can dogs be "switched" in a race as tattoos are checked prior to the start of each race. True, the numbers representing years repeat after ten years, but it is generally easy to tell a 12-year old greyhound from a 2-year old. 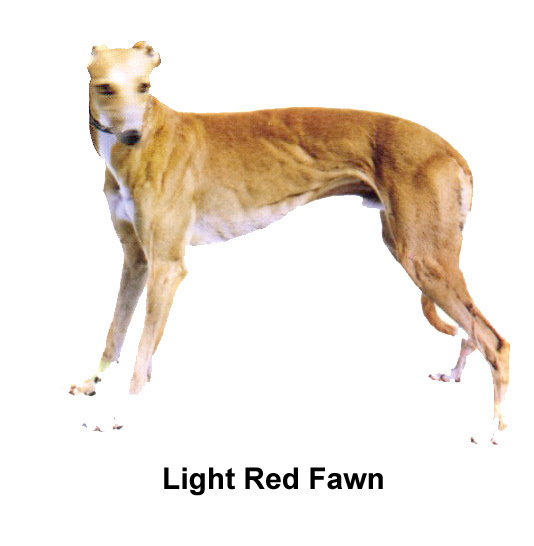 Other countries have different types of registration systems: Irish greyhounds are also tattooed in their ears, however, the Irish registry uses a series of letters rather than numbers and the tattoos can only be interpreted with the aid of a registry itself. Pet greyhounds may also be tattooed at their pet owner's request on the inside of the thigh for registration with other organizations such as National Dog Registry (NDR) or Tattoo-A-Pet. Some pet owners have implanted a microchip for further identification; please consult with your veterinarian concerning this. Dogs, like humans, sometimes need emergency medical treatment. While that treatment must come in the form of human intervention, some dogs can actually help others by acting as canine blood donors. Because human blood cannot be given to dogs, animals in need must look to one of their own for help. That help is often provided by the stately greyhound. The dog known for his speed and endurance on the racetrack is the only breed that can act as universal blood donors for dogs. 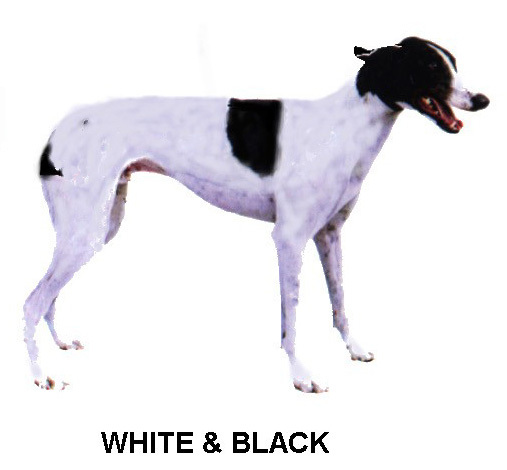 While the universal donor quality is unique to the greyhound, not all greyhounds make the cut. Only about 30 percent of all greyhounds tested ultimately qualify as universal donors which means their blood can be given to any breed of dog, regardless of its blood type. (Like humans, dogs have eight major blood types.) Even if a dog is among that 30 percent, he or she must also be free from any tick-born diseases and infections, which further reduces the potential donor pool. Other breeds of dogs can also donate blood, but their blood must be type-specific. Greyhounds that ultimately qualify as universal donors typically make great patients. The breed's size and calm disposition is perfect for the procedure, which only takes about 10 minutes. Their slender body style makes finding veins easy. During the draw, a pint of blood is collected from the jugular vein in the dog's neck, usually while he or she is sitting. Sedation is not required. Depending on its size, a qualified dog can donate blood as often as every 10-14 days, although a month or more between donations is more standard. 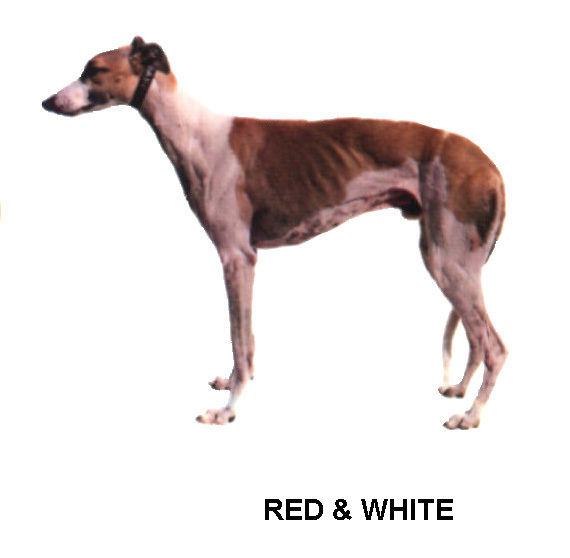 Greyhound blood has the additional advantage of being unusually rich in red blood cells, along with having lower than average white blood cells and platelets. 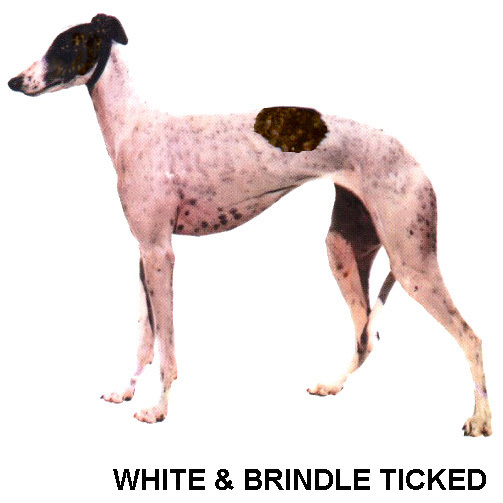 These qualities make greyhound blood even more desirable for medical use. ­­Vinney aka Venetian was adopted in 2012 by Dr. Timothy J. Thompson, DVM, Hope Animal Hospital in Marble Falls. The doc was very up front with AGA about needing a greyhound for the purpose of being a blood donor. During the initial visit to the clinic we were met by a very friendly staff. Everyone immediately fell in love with Vinney, of course, so after a physical exam by Dr. Thompson, Vinney was chosen for this most prestigious honor: hospital blood donor. There have been 2 unannounced visits to the hospital to make sure that Vinney is being spoiled appropriately. The first visit was extremely satisfactory. The second visit was just two weeks ago: Vinney came running into the reception area, tail wagging and excited to see everyone who had gathered. 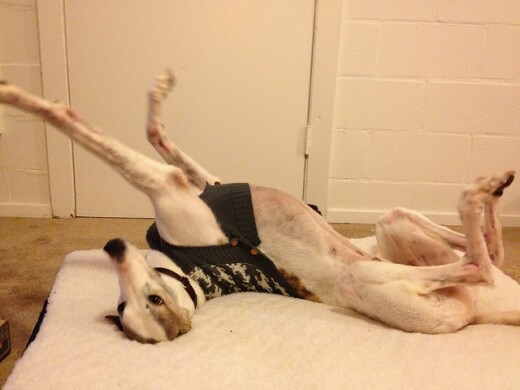 He looks wonderful: He’s the perfect specimen of a happy, healthy hound. There’s no doubt in my mind that Vinney is truly being treated as the king he is. The staff was quick to report that Vinney’s blood had saved “many lives” in the two years he’s been living there. One special story was how a little of his blood was mixed into a serum and injected into the eye of an injured dog. The eye healed and the pup has full vision.